The International Ice Hockey Federation (IIHF) has declared its support for Russia competing at Pyeongchang 2018 and criticised the International Olympic Committee (IOC) for putting the sport "at risk". In a statement following a meeting of its ruling Council, the IIHF said they "oppose the collective punishment" in the case of Russian athletes amid suggestions the entire country could be banned from participating at Pyeongchang 2018. They added that the extent to which the IOC is pursuing "punitive measures" in dealing with Russia's doping scandal is "putting the health of ice hockey at risk". The case appears to be growing for the IOC to exclude the Russian team from February's Games as the Disciplinary Commission chaired by Denis Oswald continues to sanction athletes accused of doping at Sochi 2014. It showed the IOC supported the evidence in the World Anti-Doping Agency-commissioned McLaren Report, dismissed criticism over the report's findings and backed former Moscow Laboratory director turned whistleblower Grigory Rodchenkov as a "reliable witness". The IOC Executive Board is preparing to make a decision on the extent of the country's participation at the event at its meeting in Lausanne on December 5. IOC President Thomas Bach has also seemingly hardened his stance against Russia in recent weeks, adding merit to the suggestions that Russia will be banned from Pyeongchang 2018. IIHF President René Fasel, who served on the IOC Executive Board for eight years, said the worldwide governing body wanted to outline their position as a blanket ban from Pyeongchang 2018 would "unfairly punish many Russian athletes that had nothing to do with doping". Fasel is also a good friend of Russian President Vladimir Putin. "The IIHF Council has reached a unanimous opinion that all clean athletes, including those from Russia, must be permitted to represent their country in the 2018 Olympic Winter Games in Pyeongchang," the IIHF said. "Although we recognise the need to confront doping in sport, Olympic participation should not be used to sanction the many for the actions of the few. "Russia’s role in the growth and development of ice hockey cannot be understated. "This country forms a pillar on which our sport’s legacy rests upon." 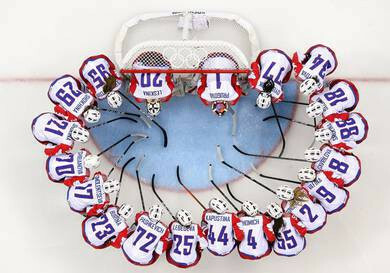 The IIHF also claimed nearly 400 Russian players have been tested since December 2016 - when the McLaren Report was published - as part of a "highly-structured testing programme". This was initiated by the Russian Ice Hockey Federation and the Kontinental Hockey League (KHL) in conjunction with the IIHF. "To this effect, the IIHF Council reiterates its position that clean athletes from all qualified Federations should be permitted to go to the 2018 Olympic Winter Games and represent their countries," the statement added. Today's announcement from the IIHF comes despite the Oswald Commission investigating seven female ice hockey players, who are implicated in being involved in the tampering of urine samples during Sochi 2014. Two of the seven are accused of submitting samples showing readings that were physically impossible to be held by a woman. The stance from the IIHF also represents the second time a high-ranking ice hockey official has criticised the IOC and warned against a total Russian ban at Pyeongchang 2018. KHL President Dmitry Chernyshenko, earlier this month, accused the IOC of "destroying the existing sports world order" by considering threatening Russia with neutral participation at Pyeongchang 2018. The IIHF are the latest governing body to clash with the IOC over the Russian doping scandal. They are the first to speak out in favour of complete Russian participation at the Games, due to take place from February 9 to 25. Last week, the IOC questioned a decision from the International Ski Federation to allow six Russians sanctioned by the Oswald Commission to take part at the opening Cross-Country World Cup of the season in Ruka in Finland.